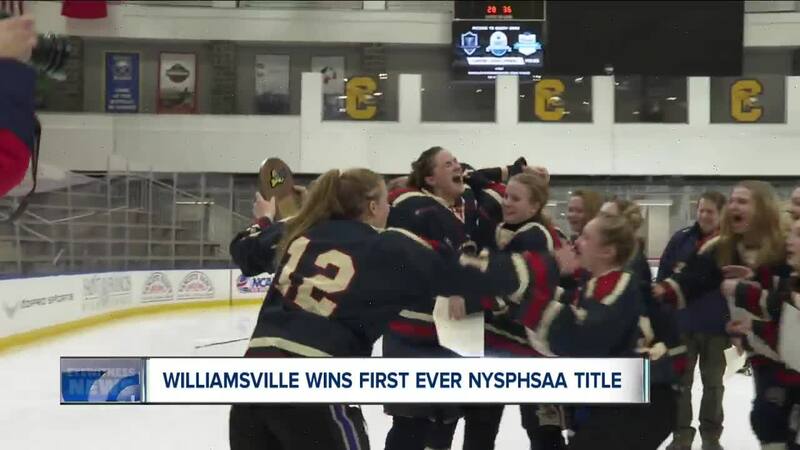 BUFFALO, N.Y. (WKBW) — For the first time in program history, the Williamsville girls hockey team has won it all. Williamsville beat Skaneateles 5-4 in overtime on Saturday night to win the NYSPHSAA girls hockey state championship. Ella Huntley had a hat trick in the win along with an assist, Elisabeth Sidorski added a goal and an assist while Jenna Cavalieri scored the game-winner in overtime. Ellie Timby got the win in goal, stopping 24 of 28 shots. Williamsville beat last year's state champions, FLOP, to claim their first ever Section VI title. They'll go for the "trifecta" when the WNY Federation Championships take place next week.